This is the fifth case study from SUEUAA (Strengthening Urban Engagement in Universities in Asia and Africa), written by Sizar Dosky of the University of Duhok, Iraq. SUEUAA is interested in how Universities in the Global South can contribute to solving geographical, economic, and social issues in their cities. The project is looking at six cities in six different countries: Harare (Zimbabwe), Dar-es-Salaam (Tanzania), Johannesburg (South Africa), Manila (Philippines), Duhok (Iraq), and Sanandaj (Iran). The SUEUAA project involves academics from each of these cities, who will be responsible for carrying out qualitative research with city decision makers, local businesses, and key members of Universities in their local areas, to better understand the ability of Universities to respond to local city issues. This blog post highlights the environmental impact of conflict and landmines in the Kurdistan region of Iraq. There are an estimated five million landmines in the Duhok region along the Turkish border. The placement of these can be linked to various conflicts, including the Iran-Iraq war (1980-1988), military operations against the Kurdish region by the previous Saddam regime, and the current war against ISIS. The Iraq Landmine Impact survey highlighted landmine contamination in 25 of 27 districts in the northern region of the country known as Iraq Kurdistan, with an estimated total of 748,651 persons living in impacted communities. 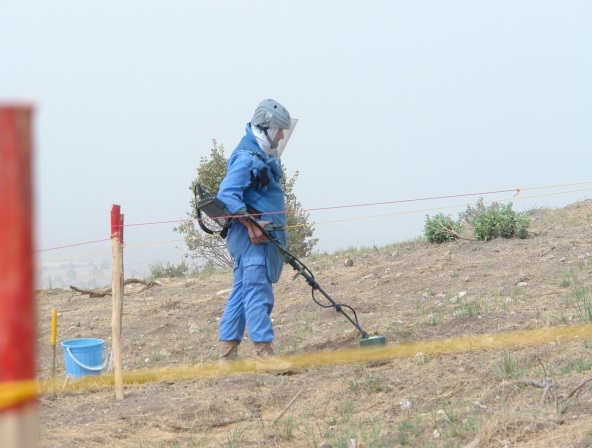 Clearance has been ongoing since 1997, and 10,077 landmines have been removed from 318 areas in the Duhok region. At present, around 66% of areas still require clearance of landmines. In 2010, the Ministry of Planning opened the Directorate on Planning and Mapping . This office is in discussion with the Iraqi Kurdistan Mine Action Agency (IKMAA) office in Duhok, exploring issues of landmine contamination and determining the scope of the problem (including measuring number of remaining landmines, and number of victims affected by landmines). Furthermore, there has recently been a call for a regional mine action strategy for areas affected by cluster strike and other battle areas . At present, none of the Duhok Governate Universities have any known research or collaboration with the Kurdistan Mine Action Agency (KMAA). However, the KMAA is presently looking for collaborative research with the University of Duhok and other Universities in Iraq. A statement from the President of the University of Duhok, Professor Mosleh Duhoky said that “we are currently in discussion with KMAA and looking for future collaboration/academic research projects regarding the effects of landmines on society, economy, agriculture, health, rehabilitation of victims, public awareness and education, and tourism. This represents a potentially rich possibility for the university to enhance its engagement with the its wider community in order to contribute to the development of city and wider regional infrastructure. Work within the SUEUAA project will help facilitate that objective”.